wawaKuala Lumpur is the national capital of Malaysia and another street food paradise for you to visit. On 94 sq mi live many ethnic groups, which the largest are Malay, Chinese and Indian. What a mixture of flavors! It was a culinary experience of epic proportions. Street food in Kuala Lumpur is just fantastic: Apam Balik, Murtabak, Banana Leaf or Nasi Lemak – the combination of different cultural influences and it’s intensity provide an unbelievable experience that you could spend months discovering. On the first evening, we did a lovely food tour with Charlie from Food Tour Malaysia. Charlie was an excellent guide who not only gave us an inside of street food in Kuala Lumpur but also it’s history, economy, and political situation. He took us to many different places, and I have decided to show you this food market where he took us to try Kuala Lumpur’s street food. The areas where you will find street food in Kuala Lumpur are areas where people live, and those aren’t in the city center. But thankfully LRT will take you to the places where people live and eat. 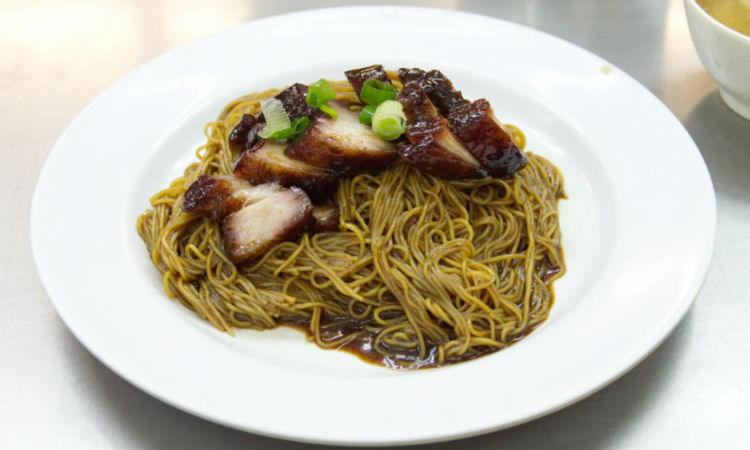 Below you will find the list of the dishes that we recommend you to try in Kuala Lumpur. Apam Balik is turnover pancake filled with cream corn, peanuts, and sugar. The one we have tried was crust and crispy. It’s called turnover because before serving it’s folded in half. Apam Balik is one of the most popular street food in Kuala Lumpur, and you can find it almost in every food market. Murtabak – the stuffed pancake is very trendy street food in Malaysia, Singapore, and Indonesia. The pancake we have tried was filled with minced meat, egg, onion, garlic, cucumber and tomato sauce. 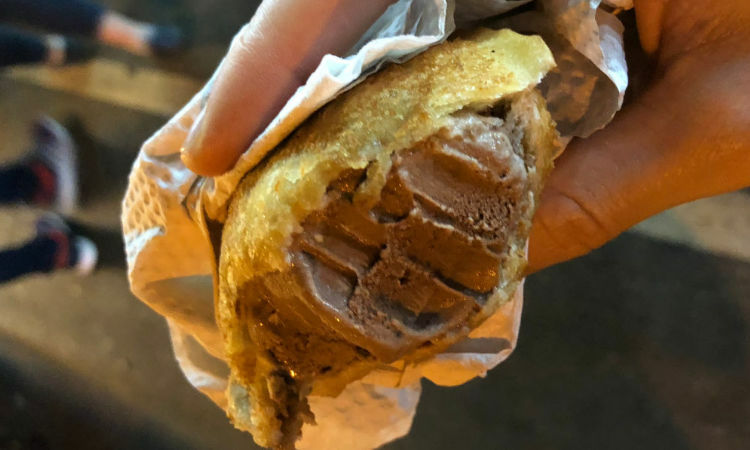 If you like sweets you need to go for Ice Cream Goreng – fried ice cream made from a breaded scoop of ice cream, that is deep fried. The extremely low temperature of the ice cream prevents it from melting in the oil. I love the combination of hot and cold in a dish! What a treat! Being in Malaysia, we wouldn’t skip an Indian restaurant. The one we visited was recommended to us, and we have decided to try it out. We have ordered some naan and some chicken tandoori. The drinks there were just fantastic! Matthias got freshly squeezed orange juice, and I went to the iced tea with lime. I loved those drinks! Our naan was also excellent; we tried the garlic one and the one with minced lamb. Both of them were served with mint and lentil dip. What a deliciousness! At this point, we want to recommend another Indian restaurant where we have eaten roti canai. In Raj’s Banana Leaf stall serve delicious dipping sauces: Dhal – lentil dipping sauce, chicken curry and fish curry and chutneys: tomato and coconut. They also had different kinds of roti bread: Malaysian style fluffy, wheat roti, fermented rice flour bread and deep fried roti. After this fantastic Indian experience, we went to Chinese quarter and tried their Wan Tan Mee. That was undoubtedly worth the trip! The char siu – bbq pork was so soft and coated in a fantastic sauce, the noodles and wontons were also very decent. I wish we had time to come back to this marvelous place to eat this pork again! Furthermore, I also enjoyed the lime juice drink with sour plum! I need to admit – the plum was not the best thing I have tried, but it gave the drink extra flavor. I just recommend – keep the plum in the glass. 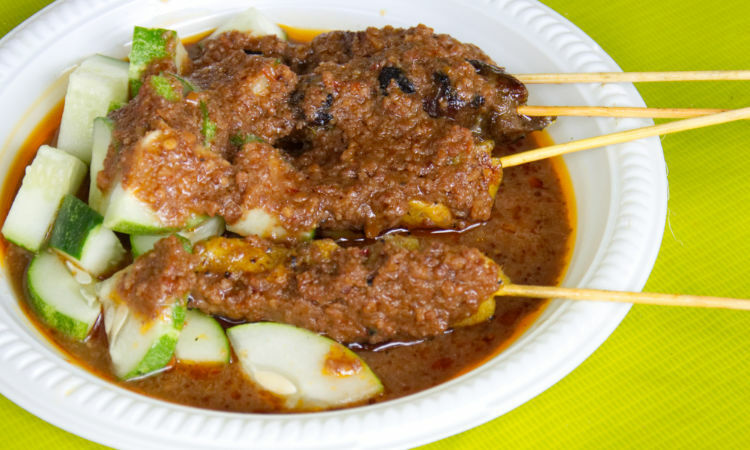 This delicious chicken satay we have found on quite small food market just in front of Kuala Lumpur University. I assume it’s only there on weekdays during the lunchtime. Those were the best chicken skewers I have ever had. The skewers are made from chicken thighs, so they are very juicy. They were served with fantastic peanut sauce made from all Asian goodies: chilies, shallots, garlic, lemongrass, galangal and ginger, peanut butter, tamarind puree and palm sugar. Finally, we went to try the last two dishes on our list of specialties to try. 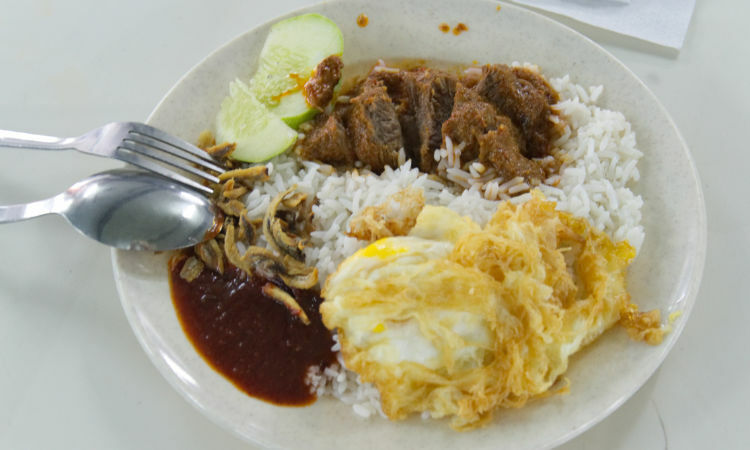 Nasi Lemak is considered Malaysia national dish, and it’s main ingredients are rice cooked in coconut milk and pandan leaves, fried anchovies, peanuts, boiled egg, cucumber, sambal, chicken and beef rendang. Beef Rendang is dry curry made with beef, which is cooked together with a paste made of spices and coconut milk until tender. The curry sauce and sambal were just delicious, but unfortunately beef wasn’t tender enough. The chicken rendang was much better! And here are the addresses of the places where we have eaten those delicious dishes! 1,2,3) Night Market Jalan Pantai Permai – only on Wednesdays!!!! Are you going on the trip to South-East Asia? Please check out another blog post about the food that we have eaten on your trip: The best Hand-Pulled Noodles in Beijing, Street food you must try in Bangkok, three dishes that you have to try in Guilin.